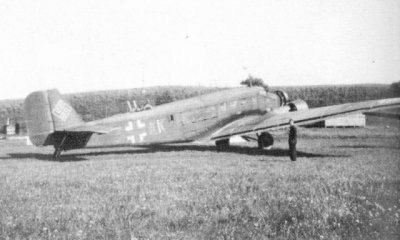 The Ju52/3m at the Rommehed landing ground. Report of the interogation of the personnel aboard the courier aircraft. Please click on the image to see it in full size and to get a translation of the text. The aircraft had taken off from Aalborg, Denmark and after an intermediate landing at Oslo, Norway, they flew on the courier route over Sweden to Pori (Björneborg), Finland. During the return flight from Pori to Kirkenes in northern Norway the aircraft got engine problems close to Lake Siljan, Dalarna. The course was changed towards Stockholm and the crew tried in vain to get radio contact with Bromma, Stockholm to if possible get directions to a suitable emergency landing ground. At last the emergency landing was made at Rommehed at 1631. After the landing it was showed that none of the crew was equipped with a courier pass. One of the soldiers and the woman were regarded as passengers. In addition the aircraft carried a 7,9 mm machine-gun and the military personnel carried four personal handguns. The machine-gun was dismantled and the handguns were carried in the hand luggage. The cargo on the aircraft consisted of among things, vegetables and two small pigs. At interrogation Frau Berger explained that she was a war widow on her way from Oslo to Kirkenes for employment at a German office. Swedish newspaper clips reporting about the emergency landing. Please click on the images to see them in full size and to get a translation of the text. The aircraft was found in such bad shape that to get it into the air again probably would require a new engine. The aircraft was dismantled on 1-5 August for transport to F1 (F=Flottilj approx. Wing) in Västerås. Inspection of the engines showed that the left BMW 132A (c/n 58250) was in bad shape and a max 1600 r.p.m. was possible. The middle BMW 132T engine (c/n 58946) was also in a bad shape and on this one the max r.p.m. was 1700. On the right BMW 132A (c/n 67776), the number one cylinder was seized. Inspection of the aircraft in October 1943 found it in an overall bad shape. The aircraft was kept at Västerås until at least 15/05/45. At the same place 1300 litres of aviation gasoline from the aircraft was stored. The aircraft was probably scraped during 1946. The crew was interned at Veberöd, Skåne but was allowed to return to Denmark on 19 August. Frau Berger was allowed to leave Sweden at once. Swedish newspaper clip of interned German aviators and their Swedish guards at Veberöd 1943 (photo taken by Stig Persson). The aviators are probably the ones from the aircraft who made the emergency landing at Rommehed. Additional information from Bo Widfeldt via Jan Rune. Additional research done by Jan Rune at the Royal Swedish War Archives, Stockholm.